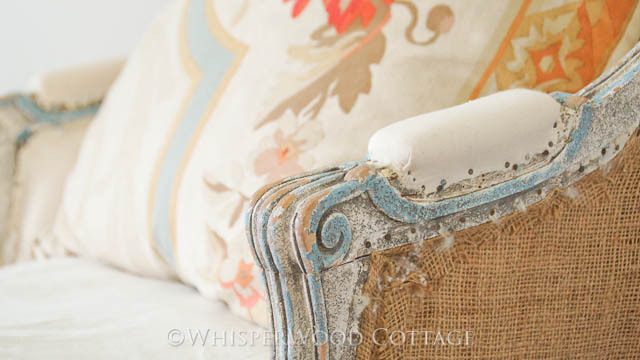 WhisperWood Cottage: Deconstructing a Chaise, Reconstructing Ourselves: Listen, Trust, Create! Deconstructing a Chaise, Reconstructing Ourselves: Listen, Trust, Create! Well, I finally did it. I stripped. Not me, silly! This chaise! Picked up at an estate sale over two years ago, it's been waiting for a makeover. It's original color is this aqua. While you maybe can't tell from the photo, the upholstery was coming undone, the fabric has seen better days, and the cushion is grimy on one side and marked with a green permanent marker on the other. Like most pieces in our home, it has taken up residence in almost every room in the house for a period of time. I debate about having it reupholstered, but I am not sure if I want to invest that much into it. I am also indecisive about what color or pattern I would cover it in. With that, it's just been in a permanent state of stalemate. At some point, I wondered what it would look like in a more deconstructed state. Then I worried that it would be unusable. I finally decided to go for it and started tearing off the fabric. Here's what it looks like now. The cushion did not have a removable cover, so I slipcovered it with a vintage army mattress cover...picked up at the Round Top Antique Show a couple years ago. I folded it over so that you can see the U.S. army stamp, top flap, and ties right in the middle of the cushion. 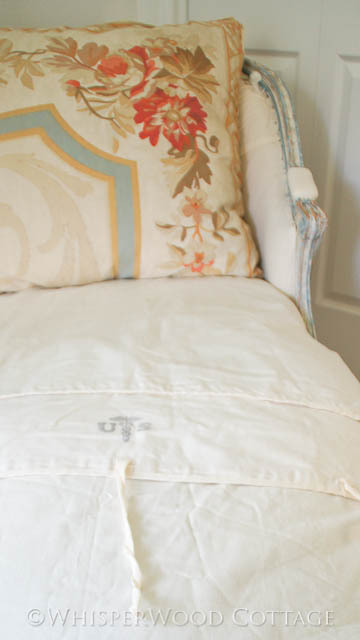 The Ralph Lauren pillow is a garage sale find from a couple years ago, too. 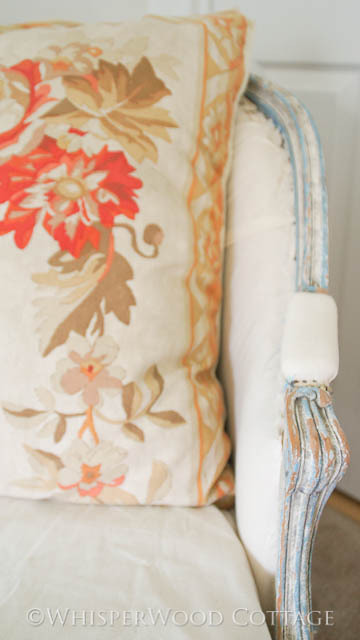 The colors of the pillow complement the neutral tones and blue of the chair frame and fabric. Whether or not you like the outcome, the main point is that you just have to follow your creative instincts, dive into projects head first, and enjoy the process. Without worrying about the outcome, I enjoyed the process and I learned a lot. As I'm writing this, I am beginning to see that this chaise represents lots of things in our lives...or at least in my own life. It represents all those things that are in a state of stalemate due to indecision, fear, and self-doubt. Well, let's get over it ladies! Let's be the wild women of DIY! The wild women of life. Let's listen to ourselves, trust ourselves, and put ourselves out there! It is in such moments of triumph that we can get in touch with and express our authentic selves! Whether it's a piece of furniture, a new career path, a needed health behavior, or a changing relationship, you have the knowledge, power, and strength to take it on. Remember...LISTEN, TRUST, CREATE! P.S. Thank you, Marian, for choosing this chaise as one of your favorites on your Furniture Feature Friday! P.P.S. 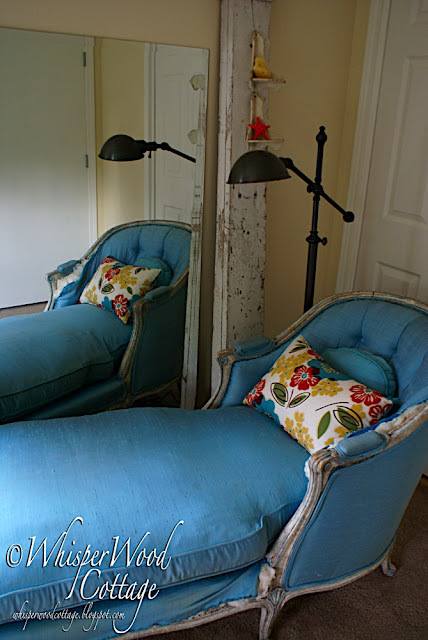 Thank you, Becky, for including this chaise on your featured list of Under $100 linky party! P.P.P.S. 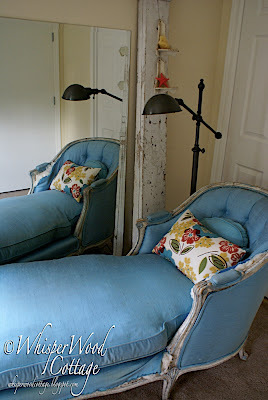 Thanks also to Donna for featuring this chaise on the Funky Junk Interiors Facebook page for Saturday Nite Special #99. Oh I love it like this. I like the back showing like that with neutral front. It's so pretty!!! I love the chase and think you will have so much deciding what you want to do with it. I appreciate the inspiration to get up and get going. I feel empowered!!! Great idea. Love the color of the wood and the rawness of the fabric. Looks great. loving how it looks now...so raw and unfinished yet beautiful...how's that for a metaphor! Love the texture. I'm a jump right in kinda woman. I appreciate fearless design. Amy, I could not agree with you more! I have been thinking on this a lot lately. Thanks for the inspiration! Absolutely love the bold attitude you took with your chaise! Way to go! I think it looks totally magazine worthy! Love it! I love the new look! Beautiful job! I am absolutely in love with the deconstructed look! You did a great job! Looks amazing! happy bday! the chaise looks wonderful like that, and i second your sentiment. i get so tired of people "copycating" other people- i wish we could al just follow our instincts and do, and erase what we think is cool or what we have seen before from our minds and just let ourselves out! I LOVE the deconstructed state! LOVE IT! It's such a cool look. I'm with you on just trusting your instincts. Even if they're wrong, how bad can it be? It's not like I'm removing load bearing walls. Thanks for the kick in the pants! We all stall sometimes and our indecision holds us back. I LOVE the deconstructed look of it. Your instincts were spot on! I think it looks great! The shabby frame goes well with the rustic look of the burlap. Looks very French to me. It's simply beautiful. I'll take 2! LOL no- Seriously! Oh I'm so glad I found you and this post!! 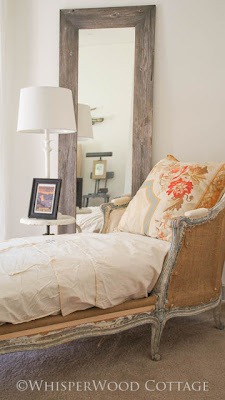 The chaise is gorgeous...and I am TOTALLY going to gather my courage and tackle the ugly/fabulous chair sitting in my reading nook...thank you for the inspiration & the push!! I do love the deconstructed look! Warm, inviting and fits this chaise perfectly. Be still my heart.... this is gorgeous. LOVE, LOVE, LOVE!! This is beautiful. I love the deconstructed look of it. And that pillow is gorgeous. Do you know what the name of the pattern is? Love it. Wow Amy!!! What a great chair makeover. it's gorgeous. and thank you for your words of wisdom at the end of the post. What a lovely and inspirational post! Self Doubt, Fear & Indecision...Beware! 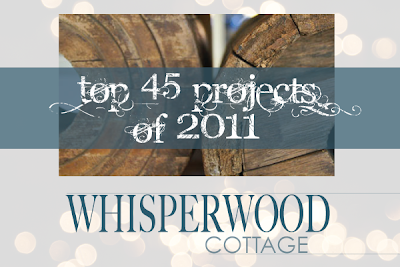 Great inspiration....furniture wise & otherwise!...Great post...Thanks for being so honest! I love this and yes, it is very inspirations! Who wouldn't love this? 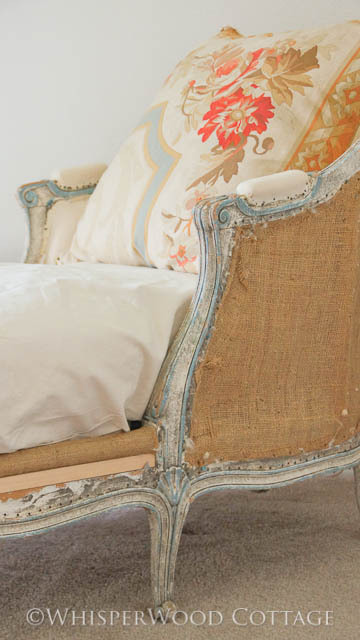 O my it looks fabulous...makes me want to go find an old chaise in someones house :) Visiting from Miss Mustard Seed! Wise words! We all have the power to be what we want to be. It is a matter of trusting ourselves. I have made a really big life change lately.Scary but I feel great! I took a leap of faith and trusted myself. And you just gave me the inspiration to attack a wonderful piece I picked up a month ago. I love the "chaise longue" in its raw form. I love this chaise. It definitely speaks to me, and it's reminding me that there is so much beauty in age. SOOOOOOOOOOOOOOOOOOOOOOOOOOOO beautiful! Love that you dove in and followed your instincts. Oh I love this just love it!! Amy, I must have somehow missed this drop dead gorgeous feature the first time around because I just found it. And my jaw is still on the floor. I am so doing this! Forget the slipcover I'll never make... just rip it! Ok, when my dh and son get done playing Playstation, I am making them haul the deconstructed Lazy Boy that I have sitting in the mid basement. It's naked now, and I haven't had a chance to touch it. I love the ruggedness and beautiful juxtaposition of the fabric and texture. I'm going to embrace my wingback for what it is and move on. You my friend are awesome!! This is amazing! I love what you said as well, what the piece represented to you, I had this same epiphany last week. Love it. Thank you so much for sharing and for those encouraging words. I absolutely love this transformation! It's so comfy and inviting, yet sophisticated. I just found you through http://eleven-o-one.blogspot.com/. And I'm sure glad I did! Now following!